Multi-Purpose Form Generator (Contact forms, Feedback forms, event registration, and many more) Created by thewebfosters. This templates have specific characteristics, namely: The most painful and time consuming task while designing a website is creating a HTML Forms with many different types of input . 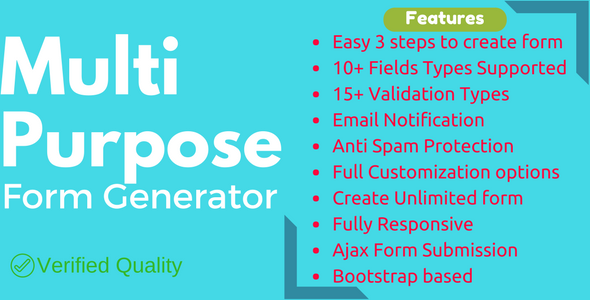 You can use this Multi-Purpose Form Generator (Contact forms, Feedback forms, event registration, and many more) on Php scripts category for ajax form, appointment form, bootstrap form generator, contact form, email form, feedback forms, form, form builder, form fields, php forms, recaptcha forms, responsive form and another uses. The most painful and time consuming task while designing a website is creating a HTML Forms with many different types of input fields. The form can be Contact form, Registration form, Feedback form or any other form. Forms can have different types of input fields along with different validation types, error messages and further processing of the form when it is submitted. Creating it manually every-time you need a form is time consuming and need technical knowledge. So, here it is “Multi-Purpose Form generator”, a PHP script which provides a easy Drag & Drop interface to build simple as well as complex forms in matters of seconds. Super easy and self-explanatory interface. Anti Spam protection – enable reCaptcha to protect websites from Spam. Full documentation and instant support. Select from H1, H2, H3, H4, H5, H6 or paragraph tags. Add links for terms & cond. Different types of input validations. Custom error messages on validation. Email notification settings. Customized email body using the input form fields. Cc support in email. Custom message notification on successfully email and email failure. Add Additional JS / CSS if needed for forms. Option to Add / Edit / Delete a form.